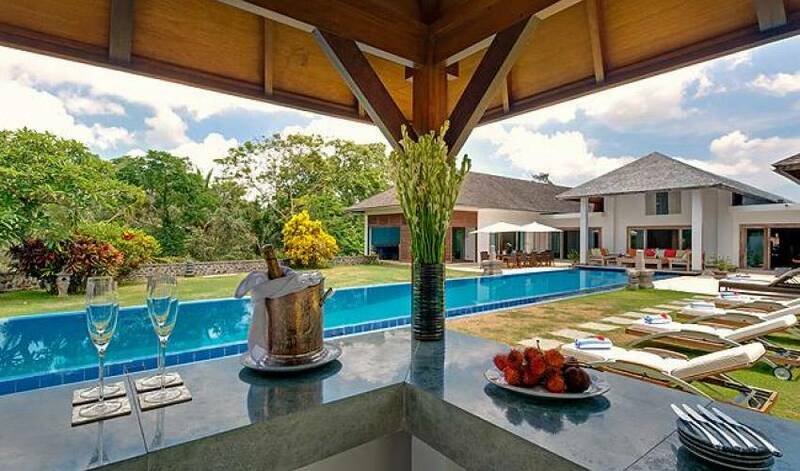 Villa 3665, which has 8 bedrooms, can accommodate from 16 up to 24 guests. 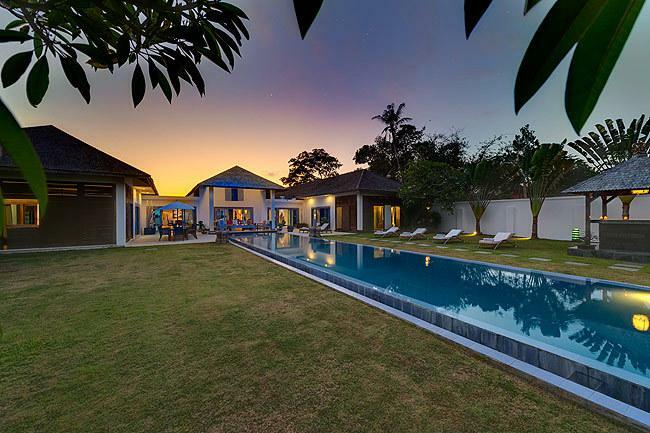 The villa is ideally located in Tanah Lot, on 1.8 hectare of land, next to Nirvana Golf course, which was awarded the best Golf course in Asia for the last 5 years, and designed by Greg Norman. The main house, that has 2800 square meters living space area on one floor, includes seven air-conditioned double bedrooms with personal bathrooms, dressing rooms, and balconies. A large reception and living area features a huge designer sofa sectional that surrounds a massive teak table, as well as a modern kitchen with bar, office, and dining room. The villa has a private cinema, tennis court, two swimming pools, and a helipad. 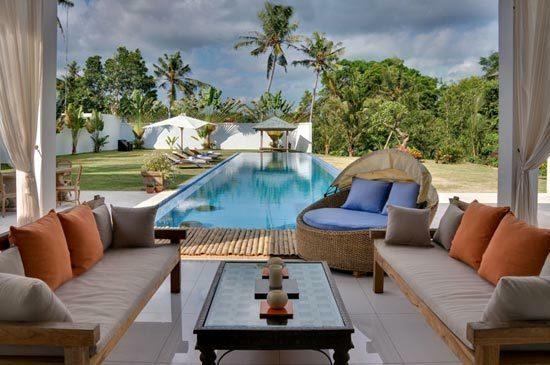 The villa is surrounded by a walking tropical garden, with two stunning swimming pools, as well as a gazebo-spa and bungalow, with a vast view on rice fields. 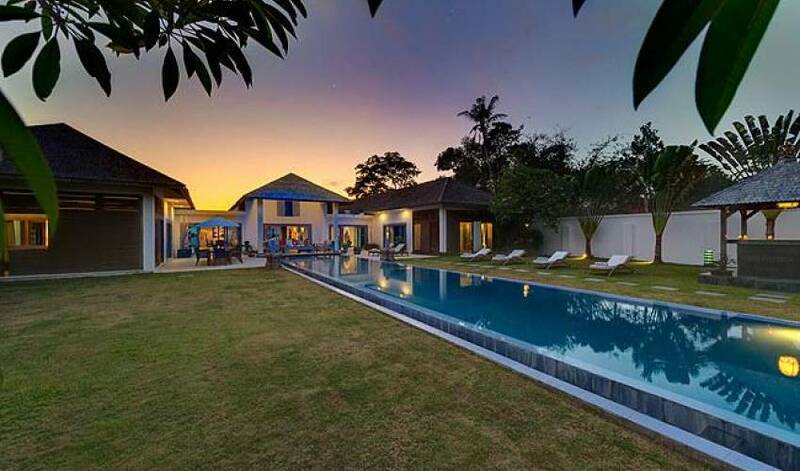 The property also includes a fitness room, a clay tennis court, a parking area, a large panoramic garden terrace for dinner or reception, andan extra bedroom. 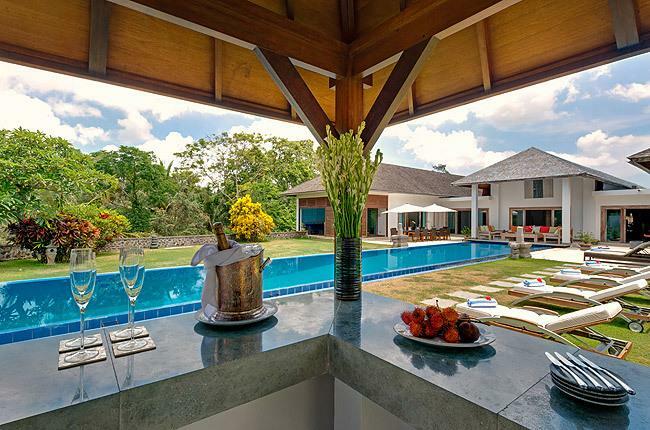 Villa 3665 was designed with outstanding entertainment spaces. Attention to detail has been paramount to ensure that all aspects of the villa complement each other. 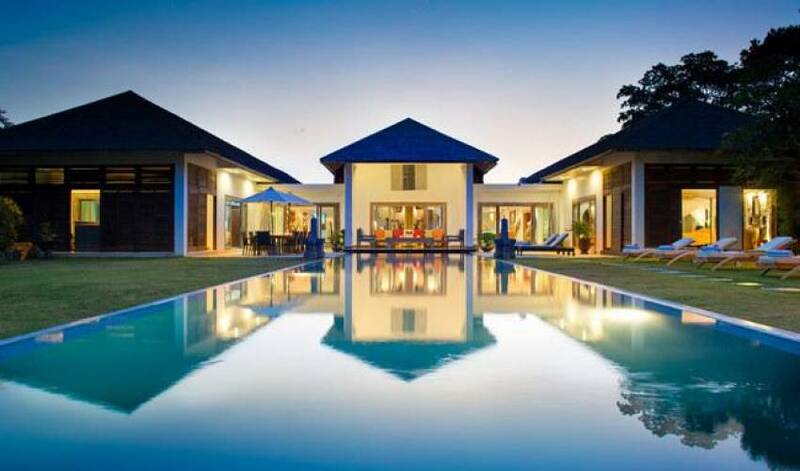 The villa has already been utilised for photo shoots from large companies and is currently being reviewed by many famous publications. 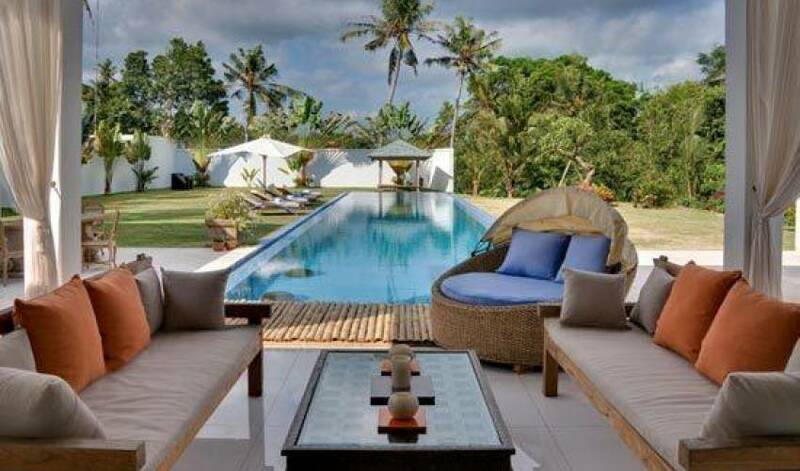 The villa comprises all modern facilities including Wireless Broadband, Satellite TV, Audio systems and full office facilities. A committed team of staff will cater to all your personal needs and desires from cooking up a five stars meal to driving you to the un-spoilt parts of the island. Land Size : 1.8 Hectares with River side view. House Size : 2800 Square meter. With main entrance for the guest and separate entrance for the staff. Main House : 2 Master bedrooms, 2 Master bathroom, 1 parental suite ( 2 bedrooms sleeping four) with ensuite bathroom, 3 bedrooms, 3 bathroom with Jacuzzi, toilet, shower and double wash basin. 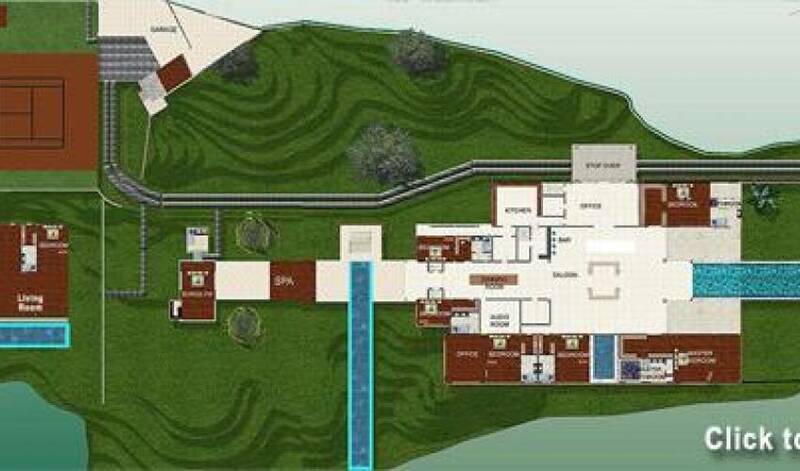 Kitchen, Bar, Living room, Lobby, Cinema, Office, Dining Room and Inside Pool. Bungalow : 2 Bedrooms, Kitchen, Bathroom and Terrace. Extra bedroom close to the tennis court. Accomodation : from 16 up to 24 guests. Swimming Pool : Main Pool: 6 x 30 Meter with a maxdepth 4.5 Meter. Infinity Pool: 3 x 30 Meter with a dept from 0.5 up to 1 Meter. Tennis Court	: Clay Tennis Court 40 x 20 Meters . Fitness Club : the workout area which is under the pool consists of one treadmill, one stepper, one stationary exercise recumbent bike, weights and racks as well as a multi-purpose pulley station. Free weights including dumbbells, barbells and exercise machines. This area often includes mirrors so that exercisers can monitor and maintain correct posture during their workout. Service Room : Electricity: 55.000 Watt. Genset backup system up to 60.000 Watt. Water: Filtration by Bio and UV system. Drinkable water for the entire house with 3 Bar pressure. Spa area : SPA services are available on demand. Master bedroom : with king size double bed, teak flooring, air condition, telephone, 42 inch Plasma TV and DVD player, sound system from B & O. The ensuite contains accessories from Grohe Porsche Design as the full body shower, double washbasins and a 2.5 x 2.5 meters Jacuzzi from Teuco and Plasma TV. Bedrooms : each includes a balcony, walk-in wardrobe and ensuite containing Jacuzzi (Kohler), full body shower (Grohe), toilet and double wash basin. Cinema room : 75 inch Plasma TV, DVD, Satellite and Sound System from B & O . The kitchen : 2 Fridges from DeDietrich, 1 meter oven from Franke, Induction Plate and Coffee Machine from DeDietrich, Zink's from Grohe & Kohler. Nothing has been left out in this kitchen that has been designed to perfection. Helipad : the villa provides a clearly marked circle surface (30 meter diameter) away from obstacles where a helicopter can land. Helicopter can be provide upon request. Others : in-house chef, internet. driver and car. Optional : driver and car. 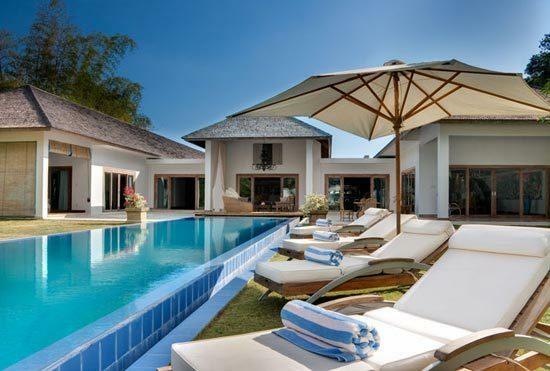 Beach : At Echo Beach, 10 minutes away, the villa has its own reserved beach with sun lounges including a bar and restaurant area.